Castilla la Mancha in central Spain is a great place for birding, of that there is no doubt. However there is more to the region than just birds. Here in the first of a series of entries about the regions cultural richness I will start with the first part of the regions name, Castile or Castilla. New Castile covers the area of Castile la Mancha without Albacete and was the area conquered by the Christians during the Reconquista or Reconquest of Spain before the great push into the Moorish Taifas of Andalucia. During this reconquest, many of the Moorish Castles were taken over by the Christians and many more were built. Calatrava la Vieja is one of those that has a very old and battle torn history. Calatrava la Vieja, the Old Castle of Calatrava stands on the banks of the Guadiana River. The site dates from as early as 785 and was originally a Moorish castle and was the capital of the region. In 1147, the castle was conquered by Alfonso VII, and was one of the most southern outposts of the Christian kingdom during this part of the reconquist of Spain by the Christians. The castle was then handed over to the Knights Templar who eventually fell out of favour and was subsequently held by the Order of Calatrava. The Order of Calatrava was founded based on the Cistercian order by St. Raymond of Fitero who, prior to founding the order, raised an army to prevent a Moorish attack of the castle in 1158. The castle was again reconquered by the Moors in 1195 after a terrible defeat for the Christians at the Battle of Alarcos. It was to remain Moorish for only 17 years though and was again recovered by the Christians under Alfonso VIII during the famous campaign which had the Battle of the Navas of Tolosa. 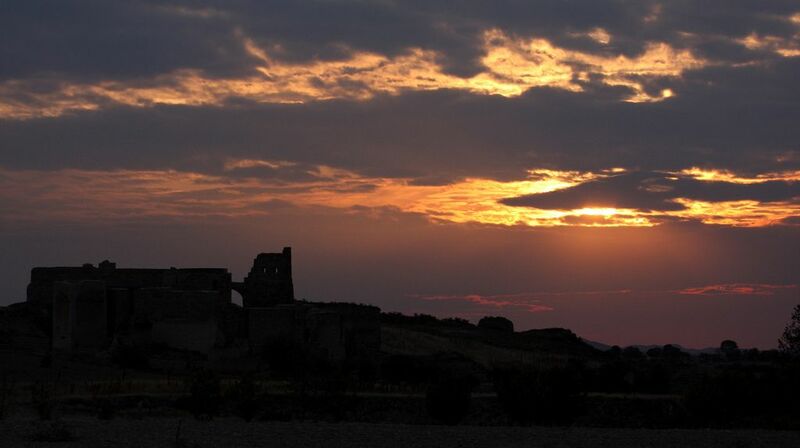 The castle has some very interesting features, such as the large stone walls and battlements, the remains of 44 towers, the moat surrounding the castle which was fed by the Guadiana River and the incomplete Templar chapel. For me, however, the most interesting feature is the ingenious old water system they had for providing water for the castle. Due to it’s position next to the river, which in the days of old flowed right next to the castle, they had a system using a water wheel to raise water up into a canal or aquaduct which then gave the castle water. Not only that but it was under pressure. Calatrava la Vieja and the Guadiana, courtesy Wikipedia. The Order of Calatrava eventually moved to their new castle near Calzada de Calatrava in 1217, which is known now as Calatrava la Nueva. Before I do finish though, let me finish on a birding note about the Castle. The area around it is rich in birdlife. Due to the proximity to the river, there are many waterfowl, herons and egrets, Black-crowned Night Heron, Black Stork can sometimes be seen and many species of waders. Just over the river is an area of steppe, dehesa and farmland, rich in raptors such as Buzzards, Kestrels (Common and Lesser), Marsh Harrier, Montagu’s Harrier and Hen Harrier, Booted Eagle, Little Owls and Eagle Owls and other steppe species such as Great Spotted Cuckoo, European Bee-eater and European Roller, Eurasian Stone Curlew, Whinchats and Wheatears and of course stars of the show, Great Bustards and Little Bustards alongside Blackbellied Sandgrouse and Pin-tailed Sandgrouse and Golden Plover. Contact us now at Oretani Wildlife to book your birding tour and take in the fantastic historical sights while you watch a myriad of beautiful birds.